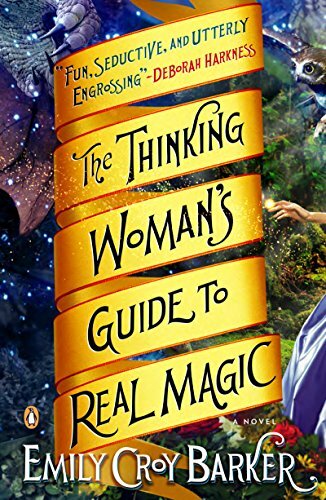 The Thinking Woman’s Guide to Real Magic, by Emily Croy Barker, is a 2013 fantasy novel. As I said when I reviewed The Demon’s Daughter, many stories marketed under the umbrella of fantasy have the superficial aspects of the genre, but not the core elements. I’m happy to say that Guide to Magic has the core elements. There’s even a dragon, both dangerous and common, as Ursula K LeGuin warned. However, what struck me most was the romance – subtle and sweet. Nora is in her late twenties; a graduate student with a stalled literature thesis and a ex-boyfriend who dumped her after four years. She’d expected a proposal, not news that he’d decided to a) leave her, and b) marry someone else. Away for a weekend with some friends, she goes for an early morning walk in the woods, takes a wrong turn, and ends up at the fabulous home of Ilissa. There are days of glamorous parties, with Nora unsure of things, yet happy in a dreamlike state. She meets Oscar Wilde at a 1920s party in New York, while vaguely aware that she is nowhere near New York, it’s not the 1920s, and Oscar Wilde died decades before the party. Ilissa’s son Raclin meets her, courts her, and makes a proposal, which she happily accepts. The wedding plans are interrupted when Nora, strolling in the woods, meets a group of soldiers patrolling the border. Among them is a magician, Aruendiel, who points out that since she cannot answer how many legs a horse has, while looking at one, she may not be in the best state of mind to marry anyone, let alone Raclin. The wedding goes ahead, Nora is soon pregnant, and her situation becomes less and less tolerable. Aruendiel rescues her, and she reconnects with reality, to the extent that she can, since reality is now a pre-industrial world with magic. She becomes a guest at the modest castle of Aruendiel, working in the kitchen to pay her own way, and decency is maintained by the presence of a house-keeper. We are now about a hundred pages into a story of 563 pages, and there are several plot threads established. Common to this type of fantasy, Nora needs to learn about this new world, and therefore herself, in order find herself and her home. Barker has done a good job of creating a coherent and functional world, and of keeping it in the background. The magic is subject to complex rules and conditions, so it cannot be used to solve every problem. Part of the pleasure of the story is the exploration of the world, though it slows the pace at times. This new world is threatened by a dark force (also a common element), and since that force is Nora’s husband and mother-in-law, both of whom want her back, it’s also a personal threat (but not the foretold destiny variety – the threat arises from her actions). The portrayal of her husband is a great example of what fantasy does best. Then there’s the relationship between Nora and Aruendiel. It grows slowly but surely, allowing the reader to savour every movement and word that builds the bonds between them. They develop that rare and quiet love that can exist between friends or lovers, together or apart. Nora left for her morning walk carrying only a copy of Pride and Prejudice, and the book plays a couple of roles in the story, in addition to being an unsubtle hint about the progress of the romance. There are also echoes of Jane Eyre, and, in one example of the book’s humour, Nora’s knowledge of poetry literally saves her life. I am also reminded of A Princess of Mars, with the genders reversed, and the heroine battling sexism on top of everything else. Although she is rescued by the hero, she becomes a rescuer. After some leisurely pacing in the middle of the book, the ending comes quickly, and some might consider it unsatisfying. I found it satisfying, and deeply romantic, but would still like to know more. The characters are rich and interesting, and many elements of them and their world remain unexplored. The sequel has been completed, and is looking for a publisher. I hope it continues the magic of this book.